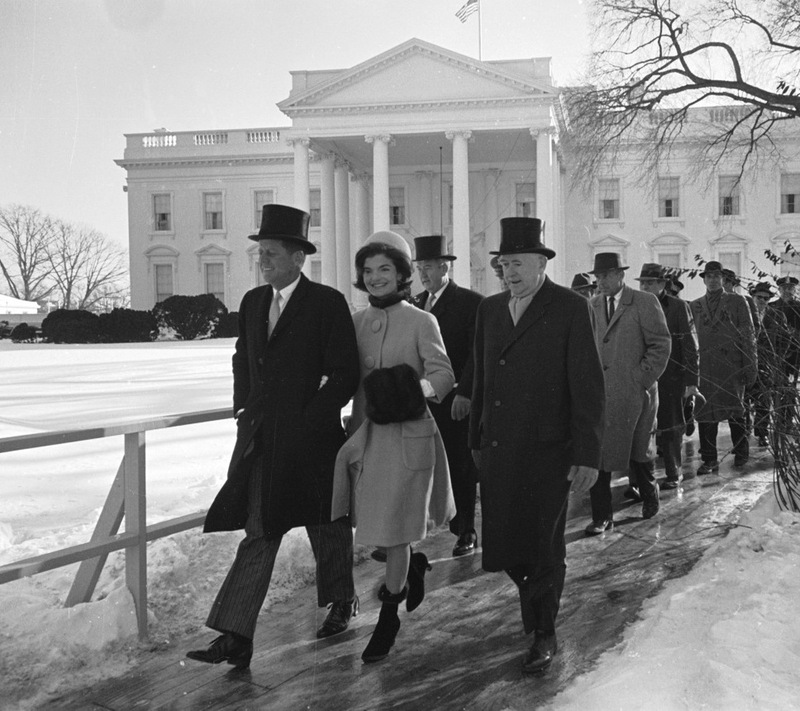 On the inaugural stand, she appeared in a simple fawn-colored suit with a muff and trim of sable, also by Cassini, and a matching pillbox hat by Halston. A few hours later, she looked regal at the ball in a silk chiffon gown and matching cape. Expressing herself through the clothes that she wore, Jackie captured the imagination of modern America which would soon begin to emulate her “good taste” in fashion, interior design, and French cuisine. Rene Verdon died in 2011. 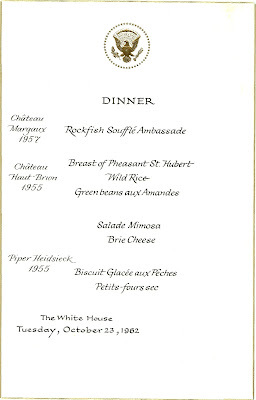 The following year, items from his estate began appearing at auction, including a lot of twenty-six presidential menus. 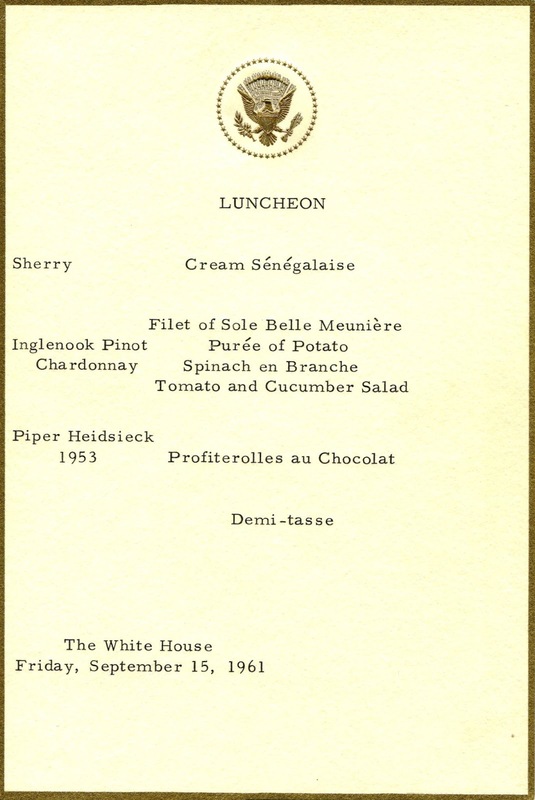 This seemingly-random group came from a broad cross-section of events, ranging from political luncheons to state dinners over the three-year-span of the Kennedy administration. 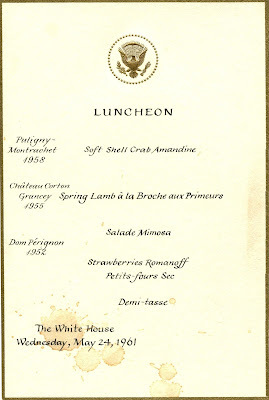 The White House kitchen had previously been the purview of caterers and Navy stewards known for their five- and six-course meals, making up in quantity what was lacking in quality. Collaborating with her new executive chef, Mrs. Kennedy introduced a more straightforward and elegant style of dining that was expressed in three courses. 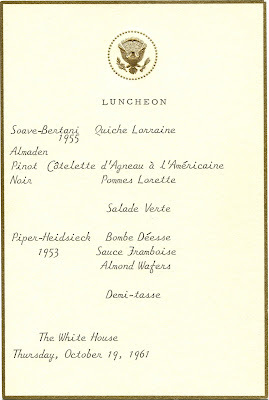 Although the dishes may appear somewhat tame by today’s standards, the cuisine was considered very sophisticated at the time. It generated a lot of interest and excitement, setting the stage for a culinary revival that would soon spread across the country when a colorful disciple of French cooking named Julia Child burst onto the national scene. 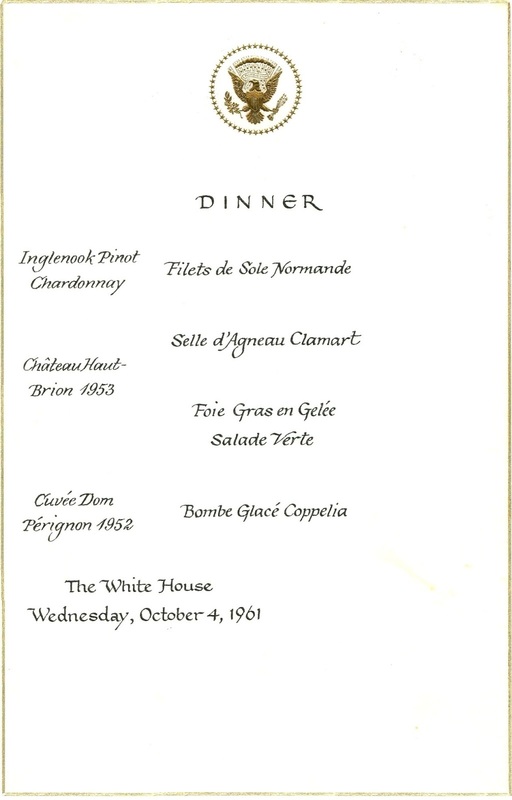 The menus also recall some of the world leaders and key events of the era. 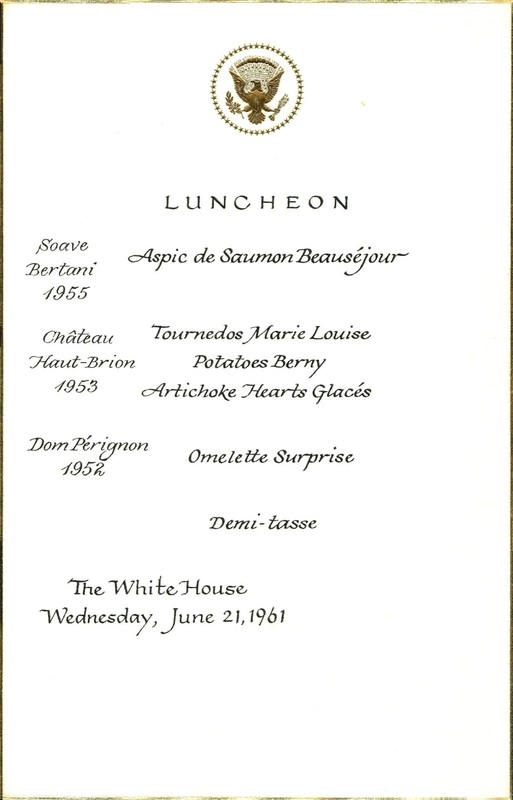 Shortly after Verdon began working at the White House, he prepared this luncheon honoring Chancellor Konrad Adenauer of West Germany, a frequent visitor during the Cold War. 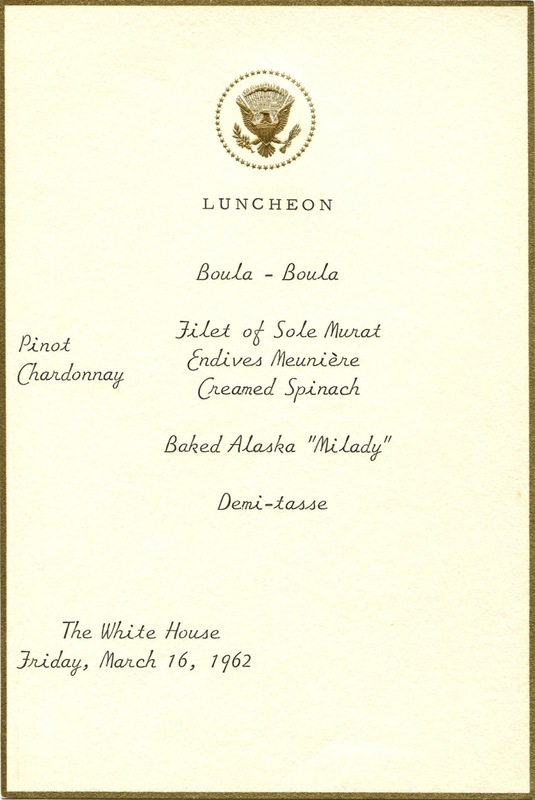 The menu is dated April 12, 1961, marking the day that the Soviet Union launched an astronaut into low Earth orbit.3 It was the first time that a human being had been sent into outer space. In mid-April, the U.S. sponsored the ill-fated invasion of Cuba at the Bay of Pigs. Although the military operation was a fiasco, JFK’s popularity soared to 82% that month, an all-time high. Deeply embarrassed by the debacle, the president remarked after seeing the opinion polls, “The worse you do, the better they like you.” The popularity of the Kennedys has remained high for more than fifty years, even though the reputation of the administration declined among historians and political scientists. 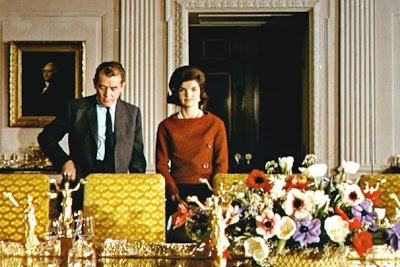 Like an enduring work of art, blending opposite elements into a coherent whole, the Kennedys combined the casual sophistication and elegance of the European aristocracy with American traits like youth and energy. By all accounts, they were a glamorous couple who knew how to turn on the charm, and a real team when it came to entertaining, each marveling at the others ability to captivate their guests. The First Couple looked happy and relaxed as they waited for Prince Rainier III and Princess Grace of Monaco to arrive for lunch the next day. Jackie was then thirty-one years old, just a few months younger than the former actress Grace Kelly. 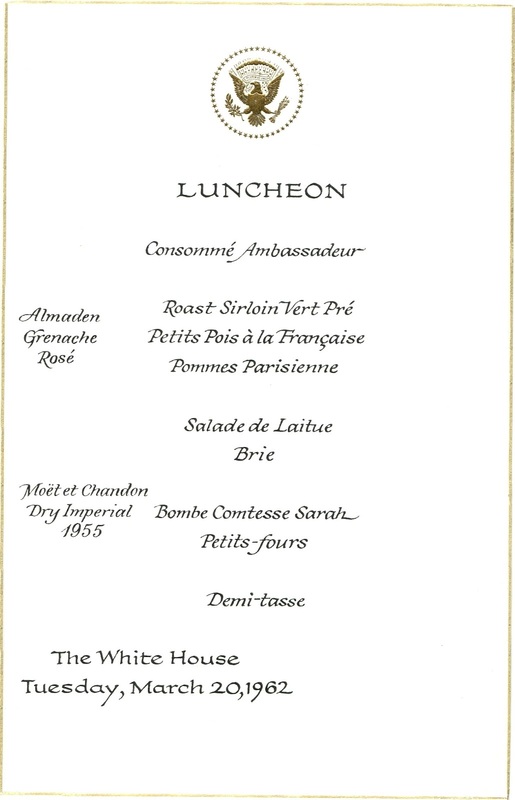 In 1961, there were about eighteen official luncheons and dinners for foreign leaders, such as this one for Prime Minister Ikeda of Japan in June. On August 15 (coincidentally, Child’s 49th birthday), East Germany began construction on the Berlin Wall, sparking a confrontation between the super powers. In response to Soviet moves to cut off allied access to Berlin, President Kennedy ordered 140,000 reservists to active duty. 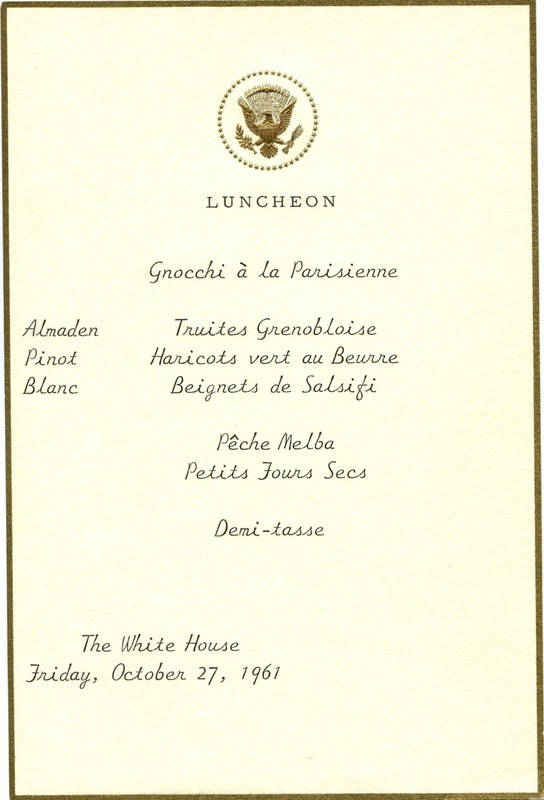 The luncheon below was held in mid-September for the foreign ministers of France, Britain, and West Germany who came to Washington to discuss the crisis. 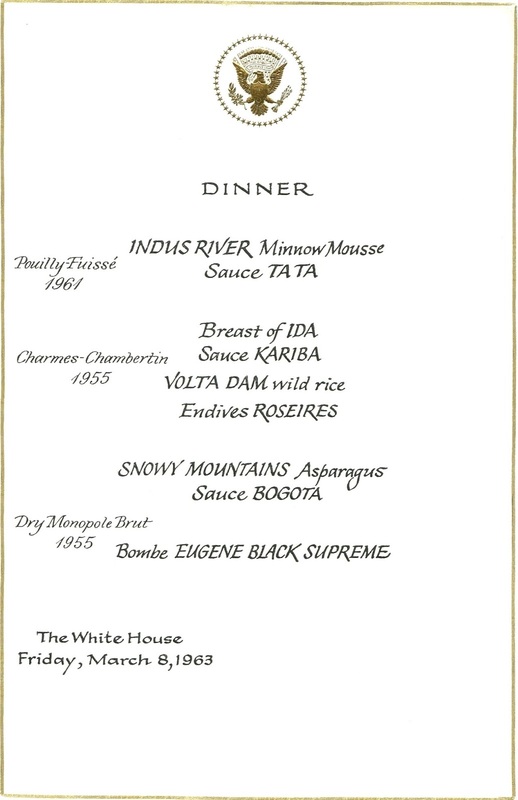 The Senegalese soup on the above menu is reminiscent of the era. First appearing by that name in the 1950s, this rich curry soup was a specialty of the “21” Club, a celebrity haunt in midtown Manhattan that was then at the height of its popularity. President Kennedy gave the restaurant a model of PT109, the torpedo boat he commanded during WWII, so that it could be could hung from the ceiling along with the other “toys” on display. 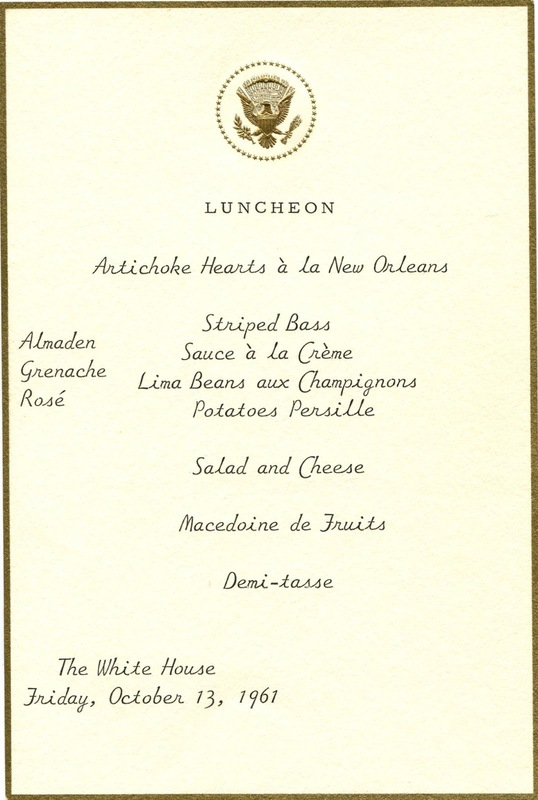 Showcasing the best of the performing arts, the White House became known for its “luxurious air of informality” during the Kennedy years. 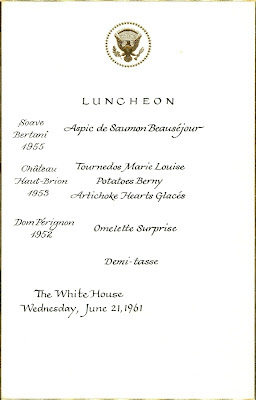 After this state dinner, Metropolitan Opera stars Roberta Peters and Jerome Hines performed selections from The Barber of Seville and Porgy and Bess in the East Room. On September 21, the Kennedys hosted a luncheon for director Otto Preminger, and the cast of the movie “Advise & Consent,” a political thriller that was being filmed on location in Washington, D.C. The ensemble included Henry Fonda, Charles Laughton and Peter Lawford, the president’s brother-in-law. The movie was a screen comeback for actress Gene Tierney who had had a romance with JFK in mid-1940s and was seated next to him at lunch. Although the singer Frank Sinatra was not in the film, he also attended this lunch, calling out “Hey, Chickie baby” when the President arrived, using the nickname he coined for Kennedy, much to the annoyance of the First Lady. 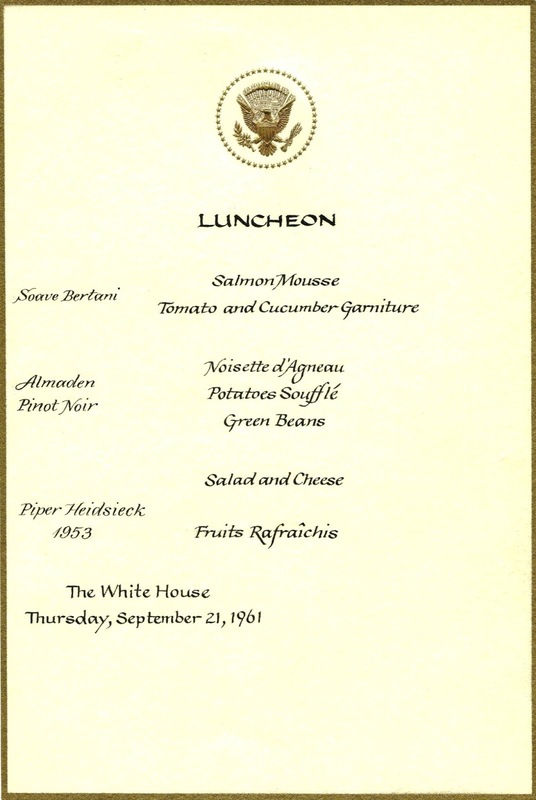 Returning to Washington in October 1961, after several long stays at the family summer home in Hyannis Port, Jackie became active again in planning social events at the White House. “She crawled on the floor among diagrams as she arranged the complex seating,” recalled journalist Hugh Sidey. 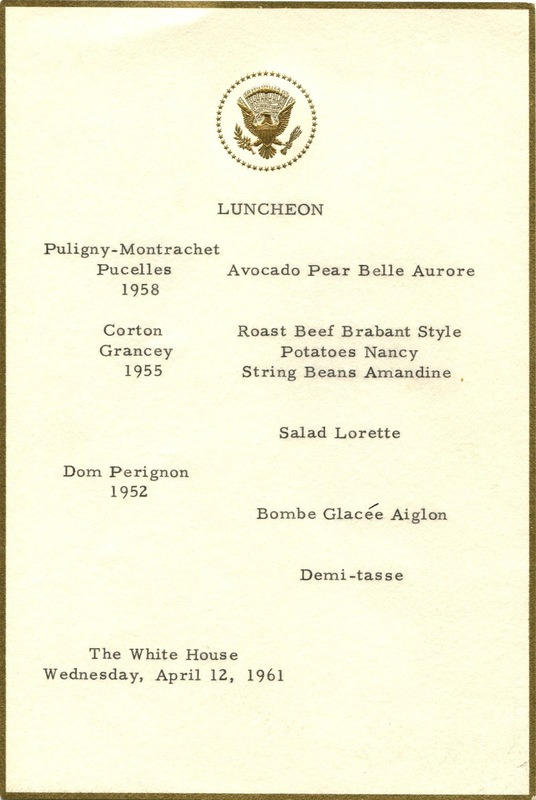 “She went over the menus minutely.” To make the dinner conversations more stimulating, she mixed artists, writers, and entertainers with politicians and statesmen. 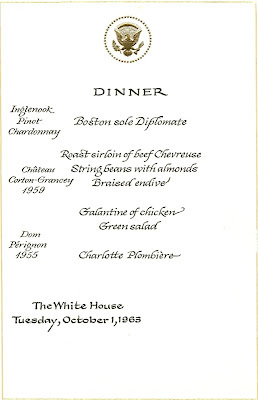 After this state dinner for President Ibrahim Abboud of Sudan, actors from the American Shakespeare Festival Theater of Stratford, Connecticut performed five different scenes. 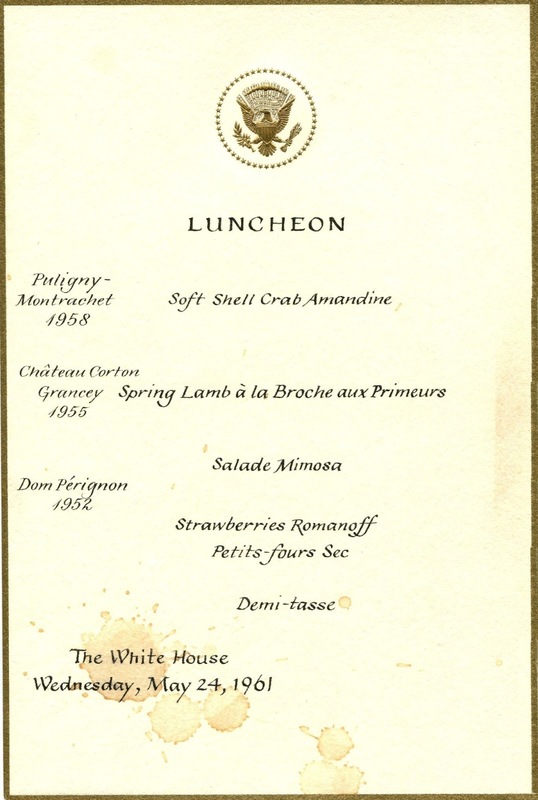 With press secretary Pierre Salinger in tow, President Kennedy hosted a number of lunches for out-of-town editors and publishers, confidant in his ability to handle the press. The one below was held for newspaper executives from Missouri. 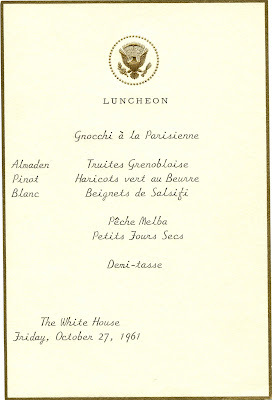 On October 16, the luncheon shown below was held for Urho Kekkonen, President of Finland. The Peace Corps was signed into law in the fall of 1961. 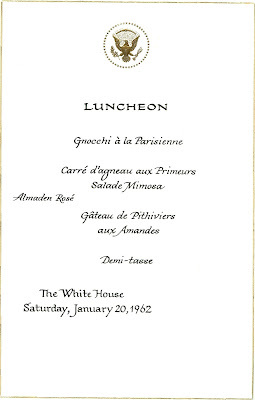 Competing with communism for the hearts and minds of the developing world, the president often entertained leaders from South American and Africa, such as this luncheon for President Sékou Touré of the Republic of Guinea, a former French colony in West Africa that is only slightly larger than Missouri. 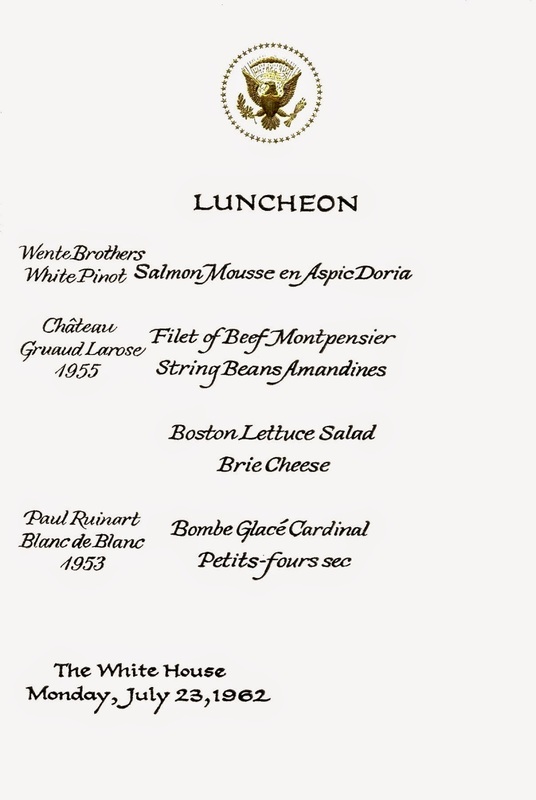 The luncheon menu below is one of four Friday meals in this series that feature fish as the main course, in keeping with the spiritual practice that Catholics once followed, abstaining from eating meat on that day each week. (Six years later, Pope Paul VI decreed that the discipline commonly referred to as “Meatless Fridays” was no longer obligatory, except during Lent.) 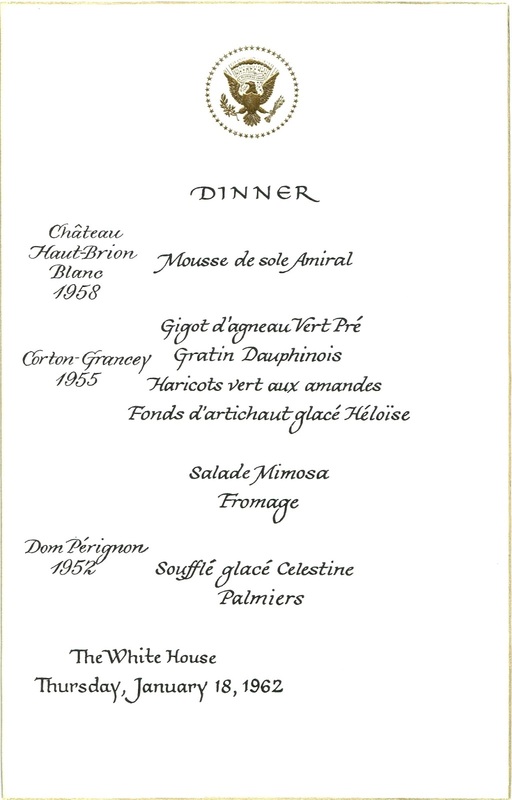 This bill of fare for a group of newspaper executives from Texas is printed entirely in French. 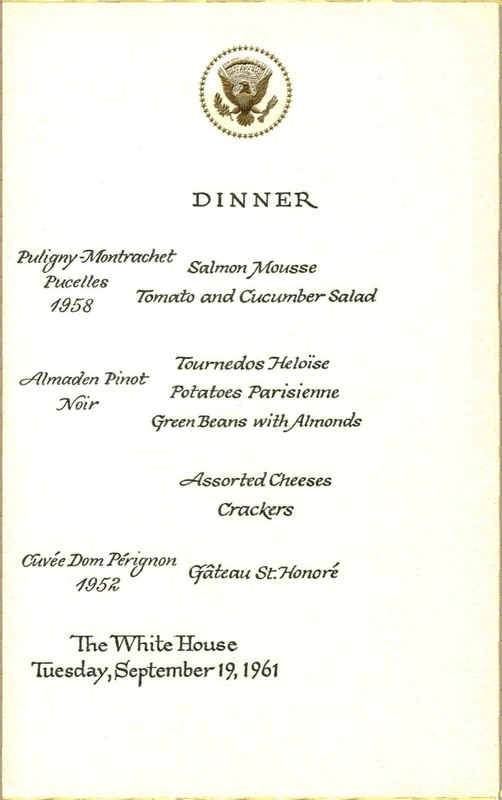 A small dinner party was held for the Russian-born composer Igor Stravinsky in January 1962. The nineteen guests came from London, Paris, and New York and included such notables as composer Leonard Bernstein and novelist Vladimir Nabokov. A luncheon was held for leaders of the Democratic Party on January 20, marking the first anniversary of the Kennedy inauguration. 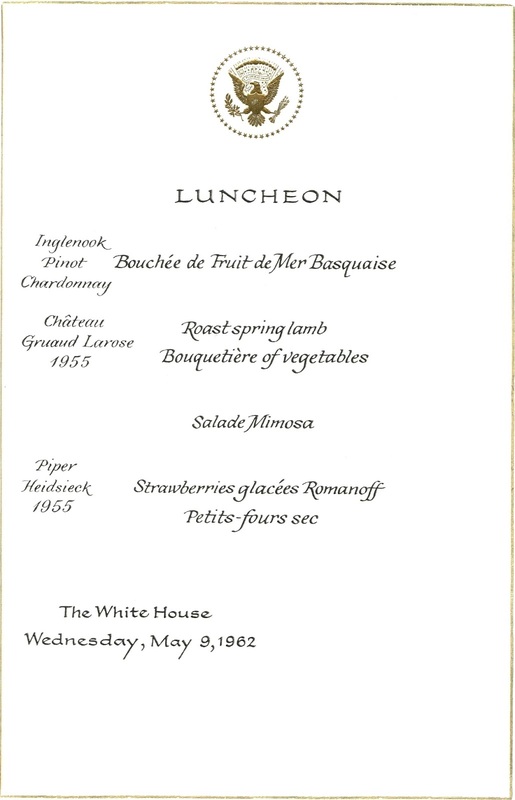 Salade mimosa begins to appear more often in 1962. Chef Verdon dressed this classic green salad with a light vinaigrette and tossed it with finely chopped hard-cooked egg yolk. 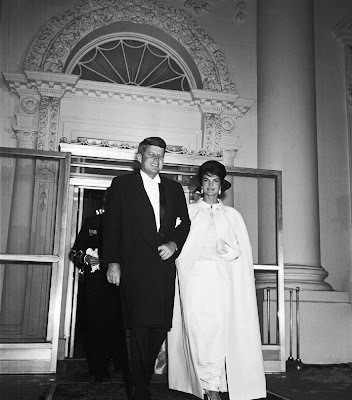 The New York Times ran an article that day reporting that Jackie was transmitting “upper-crust habits” to the “common woman.” On Valentine’s Day, the commoners received another tutorial on good taste, when Jackie gave a televised tour of the newly-restored White House. 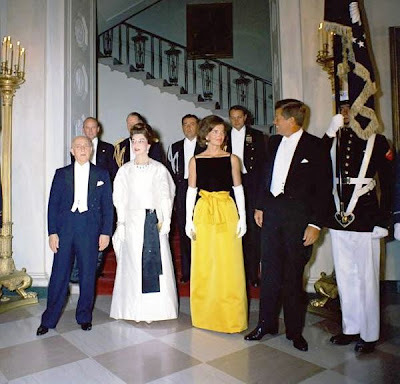 Over forty-six million people (75% of the viewing audience) watched as the First Lady moved from room to room, knowledgeably describing the new acquisitions in her distinctive low, soft voice. With the help of many experts, and some of the country’s richest families like the Henry Fords, the Walter Annenbergs, the Marshall Fields, and the Henry Francis du Ponts, she had transformed the Executive Mansion into a living museum of the nation’s heritage. 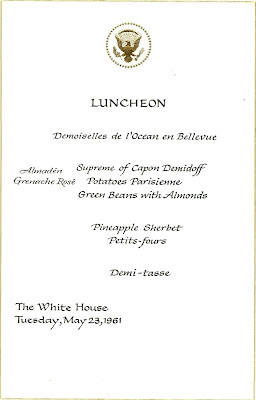 The luncheon shown below was held for President Sylvanus Olympio of Togo on March 20, 1962. 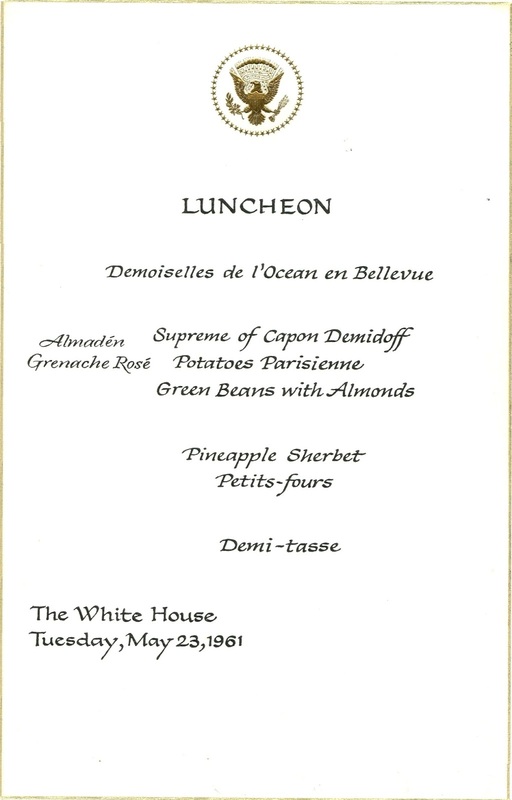 In early April, JFK hosted this luncheon for João Goulart, President of Brazil, without the First Lady who was still on spring vacation in Palm Beach. 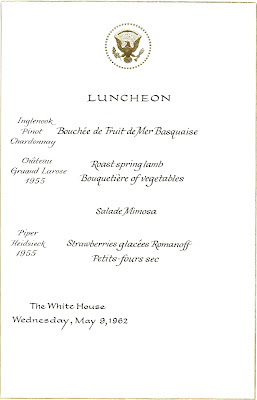 The President and Mrs. Kennedy hosted this luncheon for Prime Minister and Mrs. Gerhardsen of Norway on May 9. 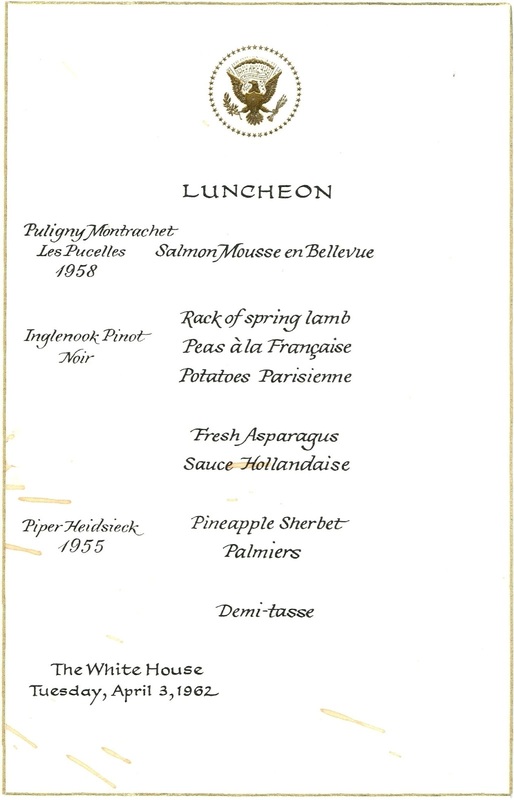 Often served at the end of such meals, petits fours sec were bite-size pastries, or cookies, made without a cream filling, but which were sometimes dipped in chocolate. 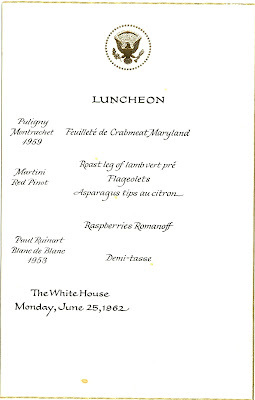 Taking a momentary break from roast spring lamb, this luncheon honoring Prime Minister Robert Menzies of Australia in June features tournedos Rossini, a classic French dish comprising filets mignons topped with hot foie gras, sliced truffles, and a rich sauce that is finished with Madeira. Once a mainstay of French restaurants in New York, this classic dish faded from the scene in the 1970s when nouvelle cuisine came into vogue. 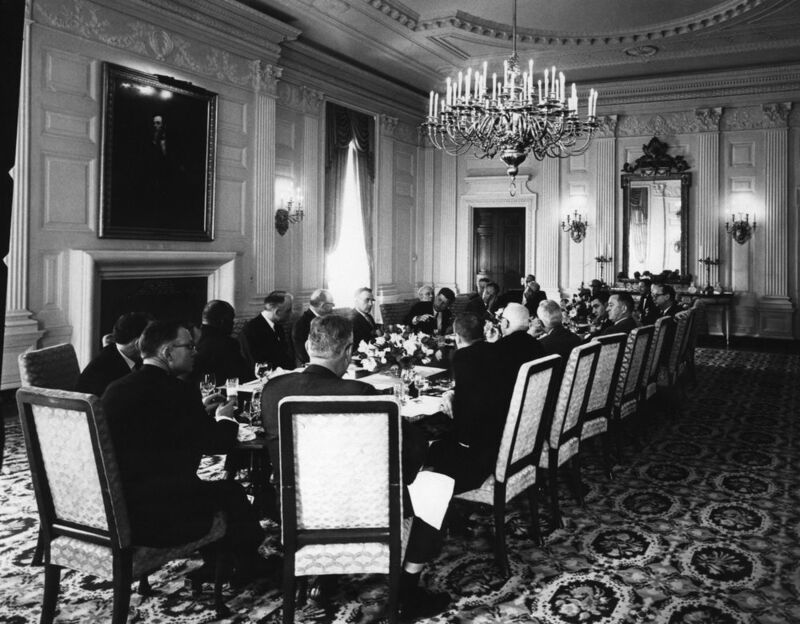 The luncheon below was held for President-elect Guillermo León Valencia of Colombia on June 25, 1962. By nature an introvert, Jackie was driven by a need for privacy, prompting her to spend long periods away from the White House. During the summer of 1962, she was gone for over three months, taking extended vacations in Hyannis Port and abroad. 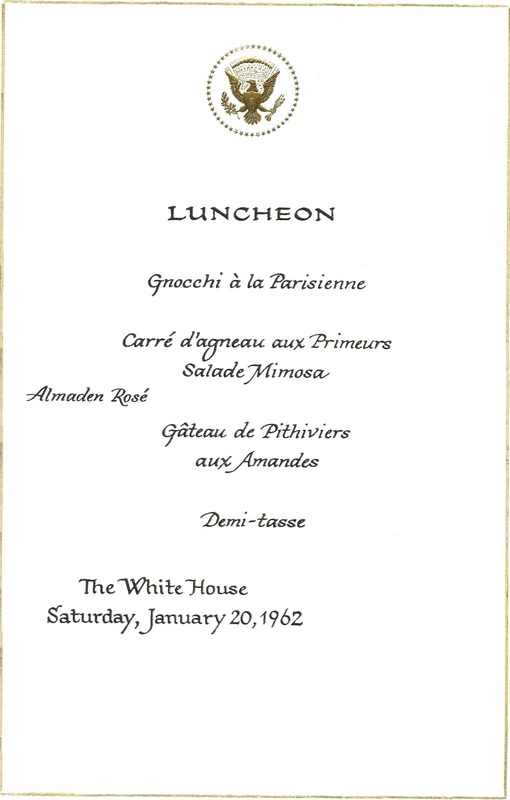 Rose Kennedy, the president’s mother, acted as the hostess for this luncheon honoring President Carlos Julio Arosemena of Ecuador. 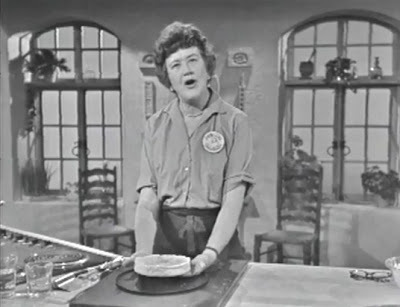 Three days later on July 26, Julia Child’s first cooking show aired on educational television in Boston. Describing her performance, Child recalled, “There was this woman tossing French omelettes, splashing eggs about the place, brandishing big knives, (and) panting heavily as she careened around the stove.” The three pilots were so successful that they were turned into a series the following year. 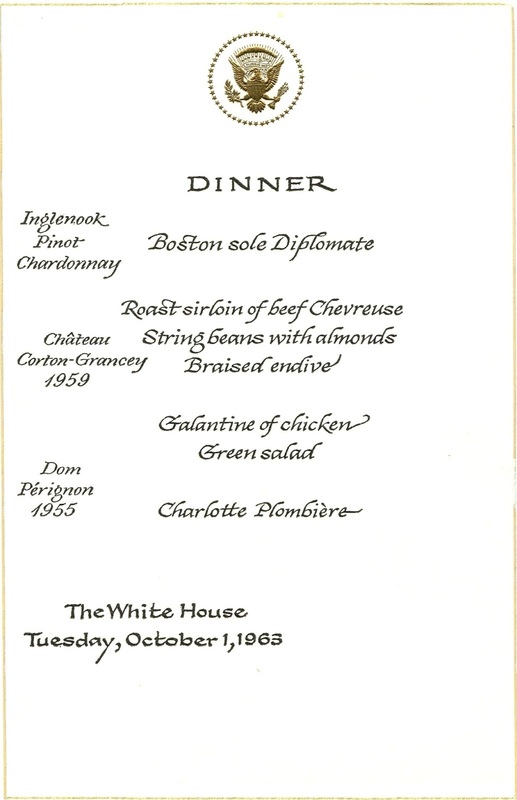 Jackie returned to Washington in mid-October, arriving in time for a dinner dance scheduled for the following week. The purpose of this social event was to thank the Maharaja of Jaipur and his wife for their help during her recent trip to India. 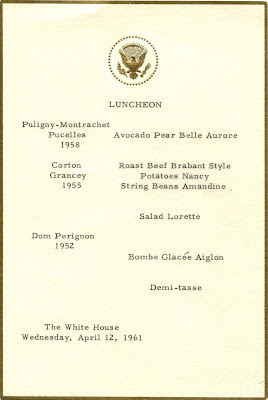 However, the dinner was cancelled due to the Cuban missile crisis; the menu shown below was never used. On October 23, President Kennedy signed Proclamation 3504, authorizing the naval quarantine of Cuba. Seemingly on the brink of nuclear war, the White House staff was issued pink cards, allowing them access to the presidential bomb shelter deep below the Catoctin Mountains near the Maryland-Pennsylvania border. Fortuitously, historian Barbara Tuchman’s masterpiece The Guns of August was published two months earlier, providing a narrative of the misconceptions, miscalculations, and mistakes that resulted in World War I. The new book weighed heavily on President Kennedy’s mind as he maneuvered for thirteen days, looking for a peaceful resolution of this confrontation with the Soviet Union. 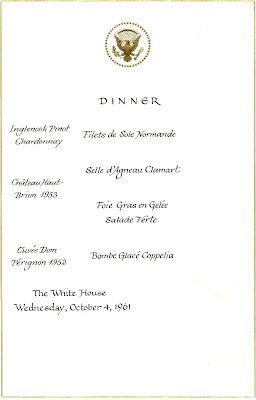 There was political pressure to serve American wines at White House events, which in those years primarily meant wines from the California vineyards of Almaden, Inglenook, and the Wente Brothers. However, this stricture was ignored when it came to the dinner dances, since these were essentially private affairs. 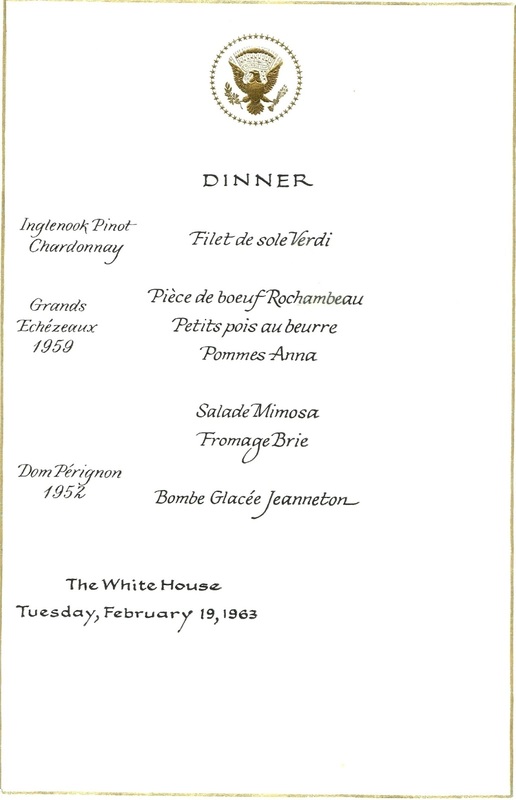 The menu shown above includes two first-growth Bordeaux wines—Château Margaux and Château Haut-Brion, a prestigious estate owned by the family of Treasury secretary Douglas Dillon. (In 1961, Dillon turned over ownership to his children in compliance with rules preventing Treasury officials from owning alcohol beverage companies.) 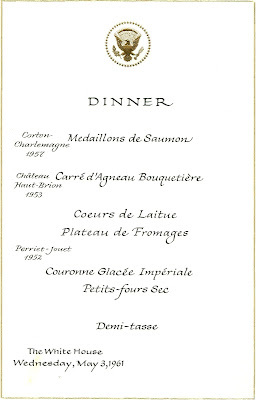 The wines of Château Haut-Brion appear on five of these twenty-six menus. 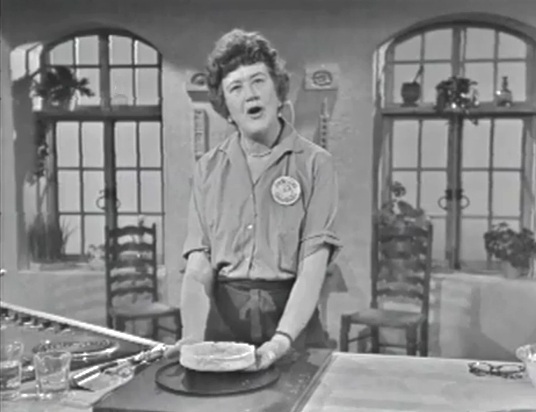 Julia Child’s television series “The French Chef” premiered on February 11, 1963. 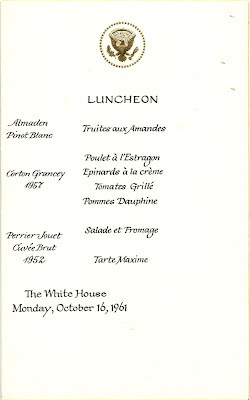 At the time, eating well at a restaurant of note in the United States usually meant eating French. 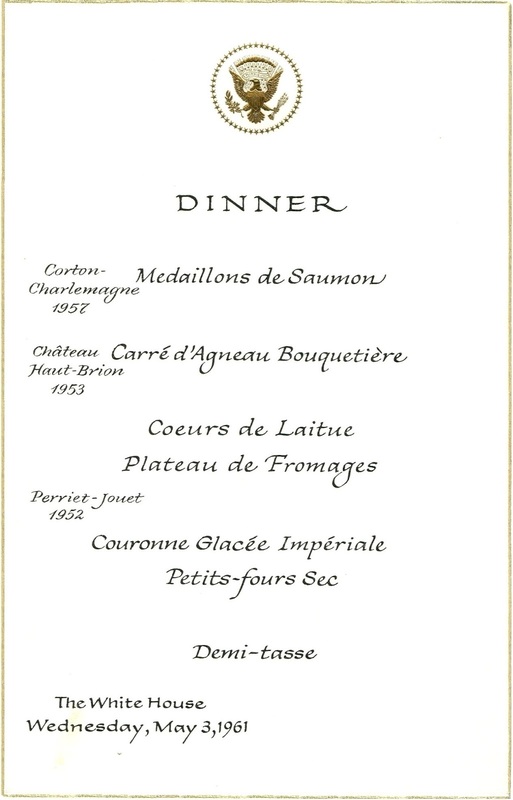 Synonymous with the most cultured dining experience, French cuisine was an intimating subject until Child convinced Americans that cooking did not need to be fancy to be good. Before long, people were turning out dishes like coq au vin and beef bourgonoine in their own kitchens. 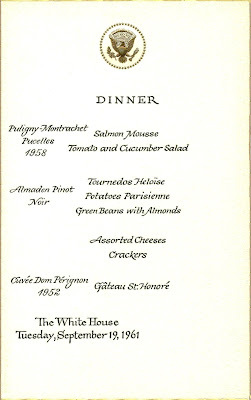 The state dinner in February for President Rómulo Betancourt of Venezuela was one of the few White House events that Jackie attended in 1963. The menu below includes potatoes Anna. In Child's 107th show titled “More about Potatoes,” the French chef explained that this buttery cake needed to be crisp and brown on the outside without having it stick to the dish. 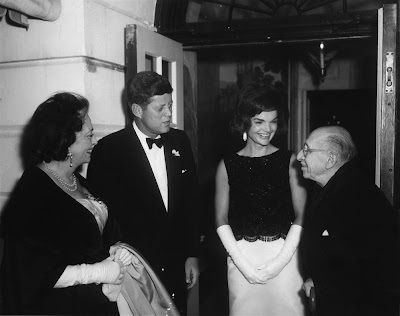 On March 8, the Kennedy’s sixth and final dinner dance honored Eugene Black, the banker who helped JFK build support in Congress for the foreign aid bill. The dishes shown below refer to various aspects of the Foreign Assistance Act of 1963. 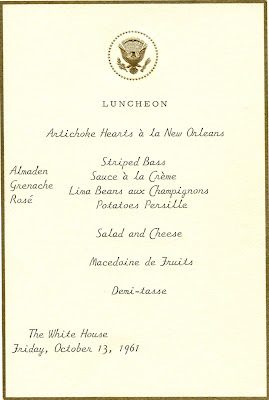 Although it sounds like an inside joke, the entrée named “breast of IDA” (International Development Association) may have been a fish dish, since the dinner was held on a Friday night. A dozen violinists played Viennese and Hungarian music during dinner in the Blue Room. Afterwards, society bandleader Lester Lanin provided the dance music until the early hours of the morning. Although Jackie made a couple of sly comments to friends that evening, she was not yet ready to reveal, even to her mother, that she was three-months pregnant. When the announcement finally came in mid-April, Jackie significantly reduced her participation in official events, even to the point of canceling previous commitments. As a result, she came to be regarded as capricious and somewhat unreliable. On August 7, the Kennedy’s son was born prematurely, and died two days later. 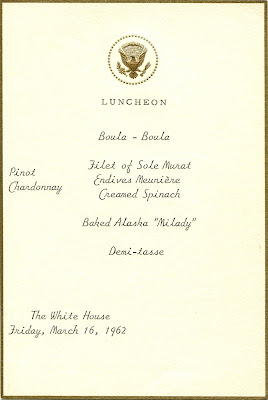 The dinner for Haile Selassie was the fifteenth and last state dinner of the Kennedy administration. 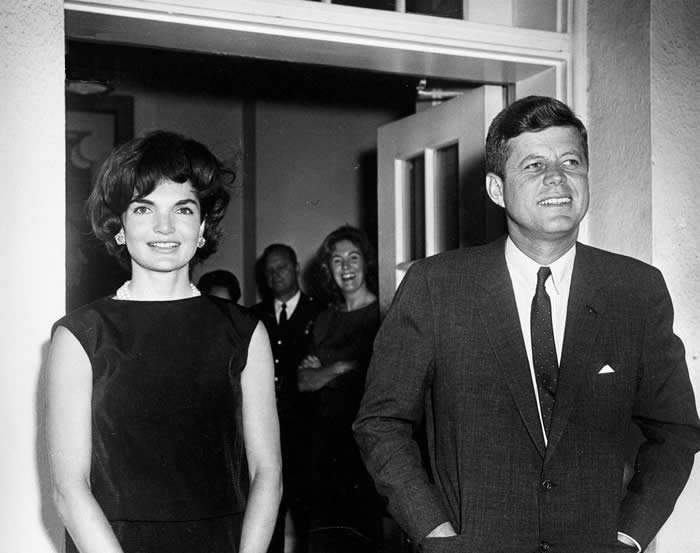 After returning from Greece, Jackie’s first official appearance that fall was to join her husband on a political trip to Dallas in the third week of November. 1. 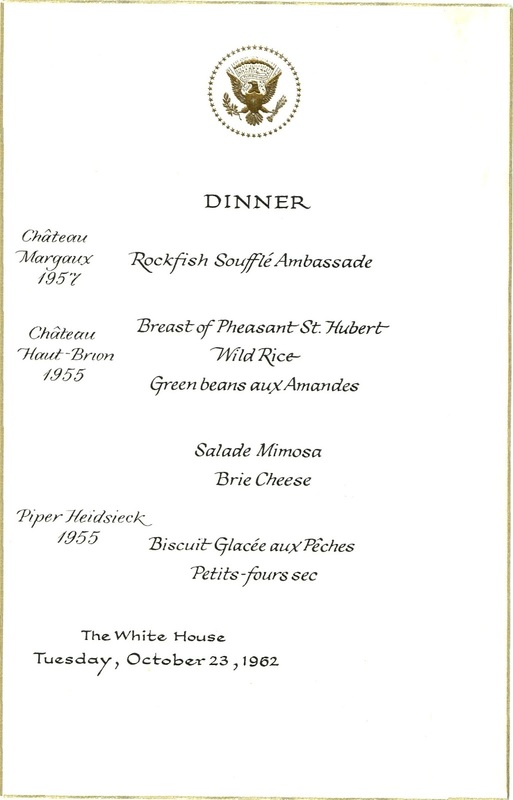 Jackie’s first choice was Bui Van Han, the tiny (5 ft.) Tonkinese chef of French Ambassador Jean Chauvel in London. 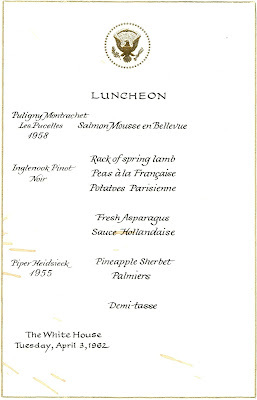 Reputedly one of the world’s great chefs, Bui turned down the job, which was most fortunate for the Chauvels who had grown particularly fond of his Pauppiette de Sole à la Richelieu and Cotelettes de Pigeone à l'Espagnole over the past twenty-two years. 2. Rene Verdon was recommended by Chef Roger Fessaguet at La Caravelle, a French restaurant that opened in New York in 1960, quickly becoming a favorite of the Kennedy clan. 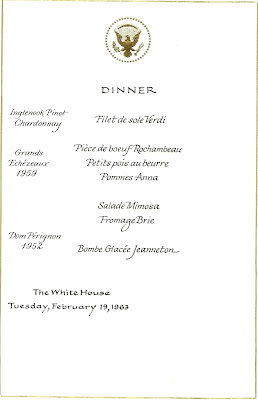 Verdon had already been working at the White House on a part time basis to help with the inaugural festivities. He was an experienced chef with a long resume that included Le Ronceray, La Calvados, and Cercle Hausmann in Paris, the Normandy Hotel in Deauville, and the French liner S. S. Liberté. He had also worked in New York, first at the Carlyle Hotel, where the Kennedys maintained an apartment, and most recently at the Essex House. 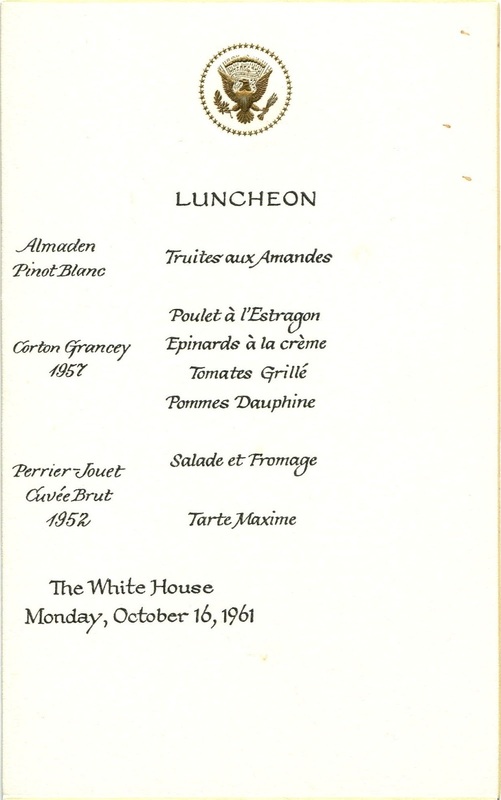 On 25 March 1961, Verdon arrived at the White House gate, suitcase in hand, ready to assume his duties as the executive chef for the next five years. 3. This less formal format, printed on regular 5- x 7½-inch paper embossed with the presidential seal, was used for eight of these luncheons; the other menus shown here were printed on 4⅛- x 6½-inch heavy card stock with a beveled gilt edge and embossed presidential seal, reflecting the traditional format established during the Eisenhower administration. 4. Alistair Horne, Macmillan, Vol. 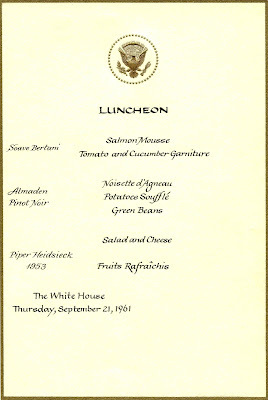 2, 1957-1862, 1989, p. 513. 6. Sally Bedell Smith, Grace and Power, 2004. 7. Oleg Cassini, A Thousand Days of Magic: Dressing Jacqueline Kennedy for the White House, 1995. 8. Barbara Leaming, Mrs. Kennedy: The Missing History of the Kennedy Years, 2002. 9. Letitia Baldridge, In the Kennedy Style, 1998. 10. 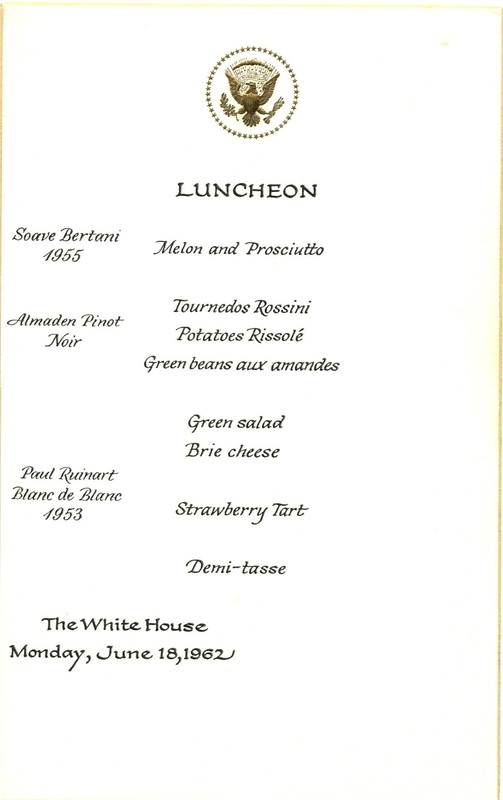 Rene Verdon, The White House Chef Cookbook, 1968. Absolutely brilliant. I learned so much, even after researching this myself. I love the way you dig into the topic and come up with such gold. The menus are amazing. Our Jackie did love her lamb, didn't she? I love the way you tied Julia Child' s success to Jackie's tastes and the desire of American women to emulate her style (as if a mortal could do that successfully). 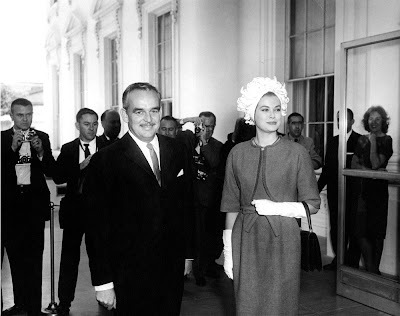 Love the way you tell a story and am amazed that Grace Kelly needed to stready here nerves with two double Bloody Mary's before meeting the Kennedys. It seems as though you have an insider's view about who had a few too many drinks! What a feast, Henry! What a great piece of work! wow. such an interesting and informative post. i love it. 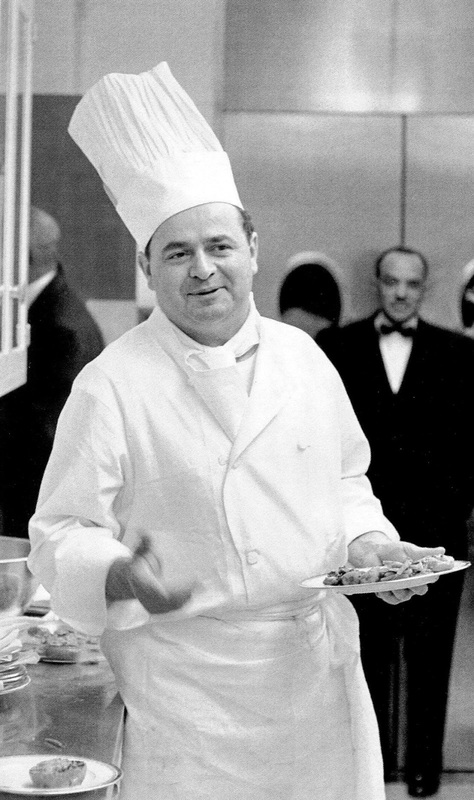 Loved reading about Rene Verdon, WH chef during the Kennedy administration. What a great collaboration between this much sought after chef & our Queen of Camelot. Highly informative! Great job, thank you! As for Grace Kelly, I had read she had a drinking problem. this certainly attests to it. The marriage was a joke - neither took their vows seriously. But that's a whole other story. What did Jackie and Grace really have in common? Daddy issues. Read up on it. Wonderful article, thank you so much! 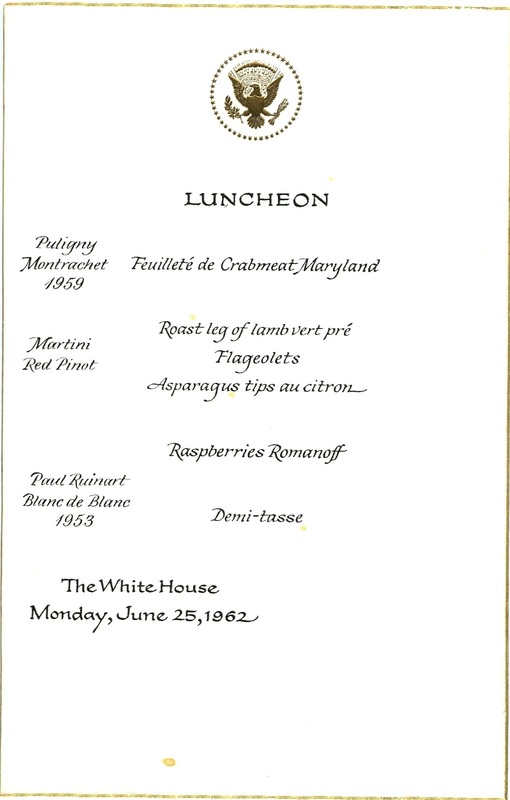 One question: do you have any idea what "roast beef Brabant style" is? Never heard of that.